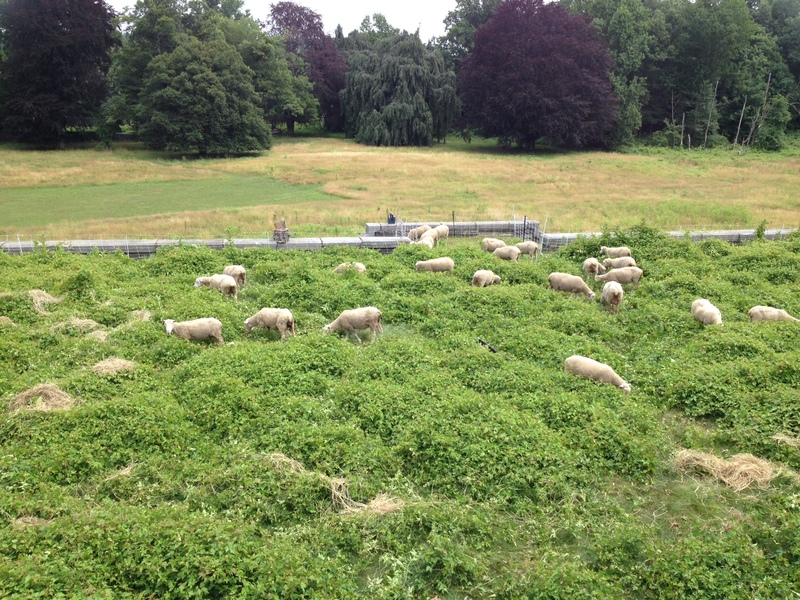 One hundred Southdown sheep once mowed the expansive lawn of William Rockefeller’s estate, Rockwood Hall, in North Tarrytown, NY. A century later sheep and goats are grazing once again, but now the property is part of Rockefeller State Park Preserve (Preserve) in the renamed community of Sleepy Hollow. 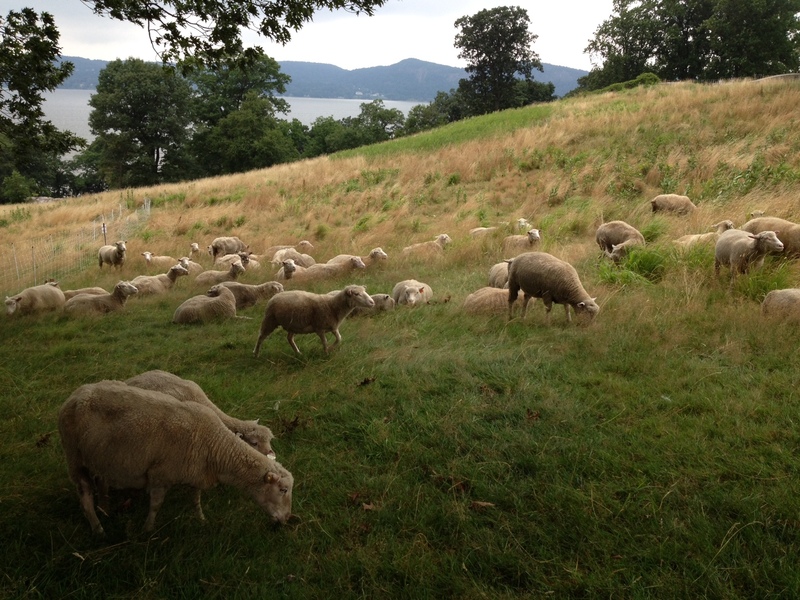 Sheep grazing at Rockefeller State Park Preserve. Over recent years, the steep slopes and historic stone foundation overlooking the Hudson River became overrun by the highly invasive akebia vine (Akebia quinata), porcelainberry vine (Ampelopis brevipedunculata) and other invasive species. To control the vines and manage the grassy hillsides, the Preserve has partnered with Stone Barns Center for Food & Agriculture, a neighboring non-profit working farm and education center, to rotate sheep and goats around the foundation. Stone Barns gets more grass and forage for their sheep, while public lands get invasive species more under control in an ecofriendly way. The project was begun in mid-summer of 2014 with 50 sheep augmented by 7 goats over four months. This year Rockwood Hall will host 10 Boer goats, 30 Tunis sheep and 50 Finn Dorset sheep. They are rotated every 4-6 days through small paddocks enclosed with temporary electric netting and peripheral fencing. Chris O’Blenness, a farmer employed by Stone Barns Center, is managing the flock and stays on-site at night in a travel trailer. This is the first joint Rockefeller State Park Preserve-Stone Barns Center experiment aimed at improving landscape health and ecosystem function. It is also a potential strategy for increasing access to land for beginning farmers. Chris O’Blenness is representative of beginning farmers and ranchers who are searching for land to work. This type of symbiotic grazing arrangement on public lands is a potential model for other public lands that can offer beginning farmers affordable opportunities for land access—all while performing a vital public service and delighting Preserve visitors. 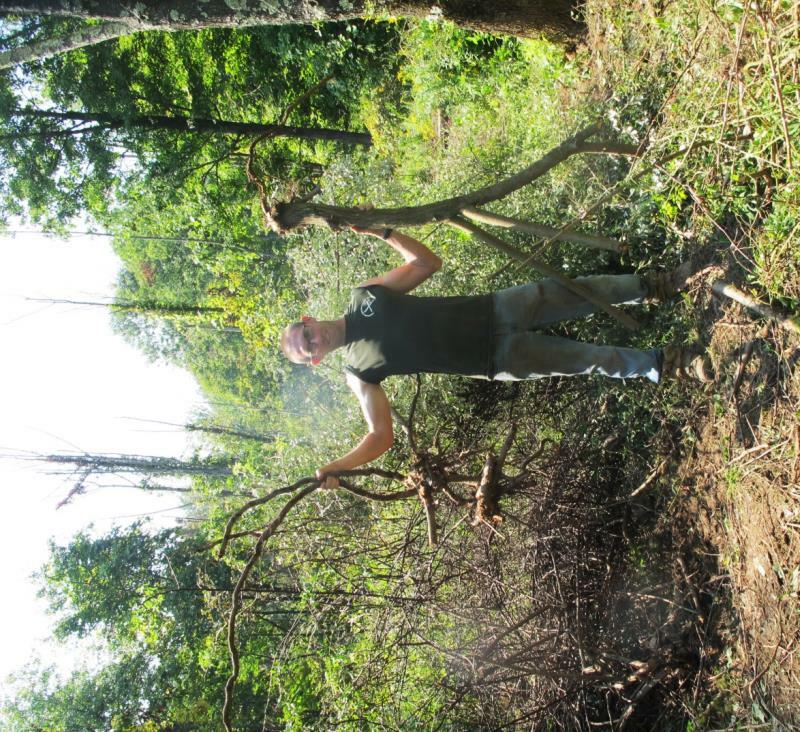 Envisioned as a multi-year initiative, this on-going land management is needed to make headway against the fast-growing spread of invasive species. So far grazing is making a difference, but progress would be lost if grazing were stopped. Although 90 grazing animals sounds like a lot, it’s not on a large landscape. We have also added weedwacking and mowing to the rotation. Since the grazing started, one terrace, once engulfed in a 3 foot tangle of thick porcelainberry vine, is now able to be mowed weekly and visitors are able to spread blankets on grass and picnic where no one dared before. Terrace with porcelainberry in the summer of 2014. 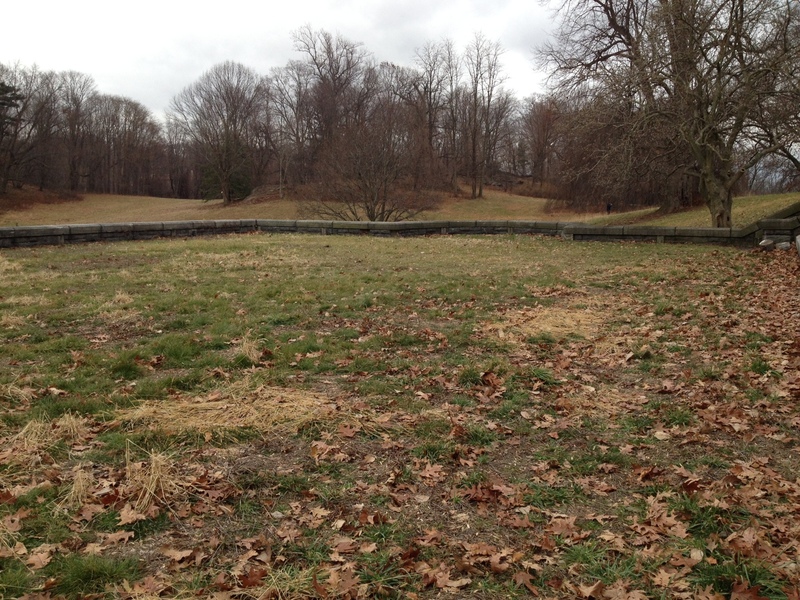 The same terrace in December of 2014 after grazing and mowing. As the Preserve and Stone Barns gain experience and increase numbers of animals, we’re hoping to fine-tune the grazing to achieve ecological and foraging goals. Meanwhile, the baas of the sheep and goat greet visitors, many of whom now stop and look and think about invasive species and land management challenges. 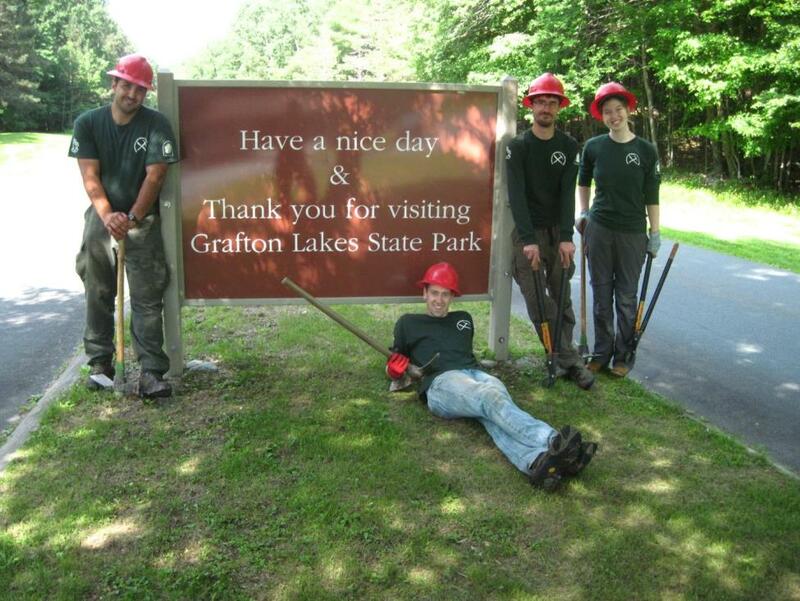 Post and photos by Susan Antenen, Rockefeller State Park Preserve Manager. 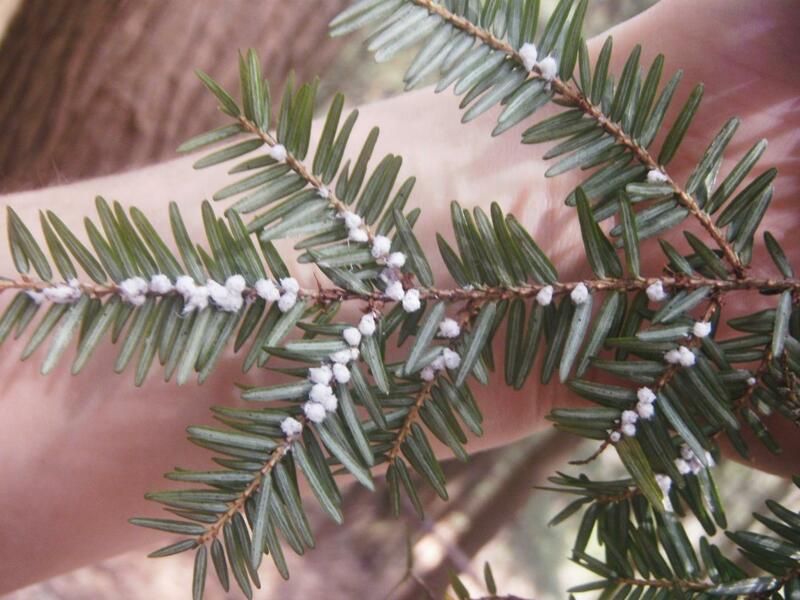 Hemlock Woolly Adelgid appears as white fluffy balls on the underside of hemlock branches during the cooler months. 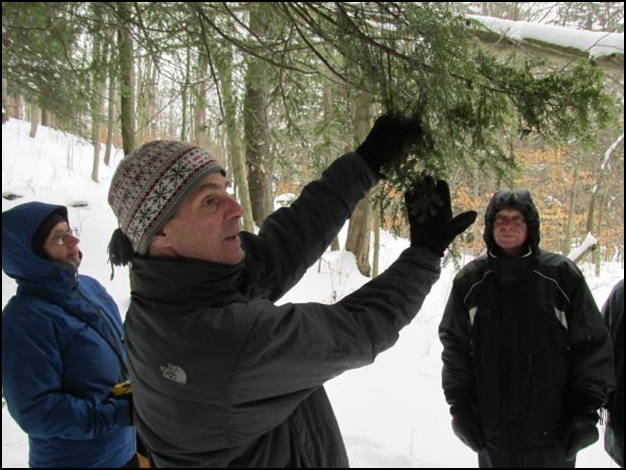 Hemlock Woolly Adelgid (HWA) is a tiny, invasive insect which kills hemlock trees in a matter of 6 years. Please see the previous post on HWA for more information. The insect was introduced in Virginia in the early 1900’s, and has steadily spread since then. New York state contains all stages of HWA infestation. There are heavily infested areas like the lower Hudson Valley, which have harbored HWA for 20+ years and contain increasing numbers of declining and dead hemlocks. 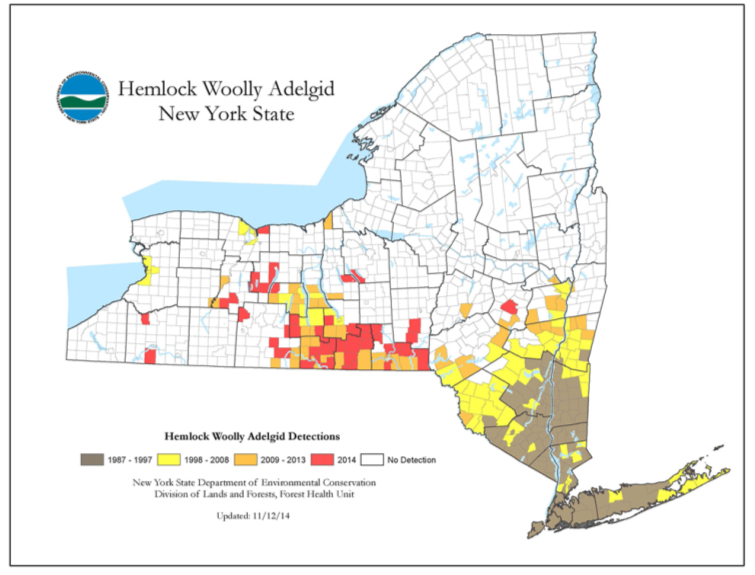 Moderately infested areas include the Finger Lakes, where some areas have HWA and some do not. 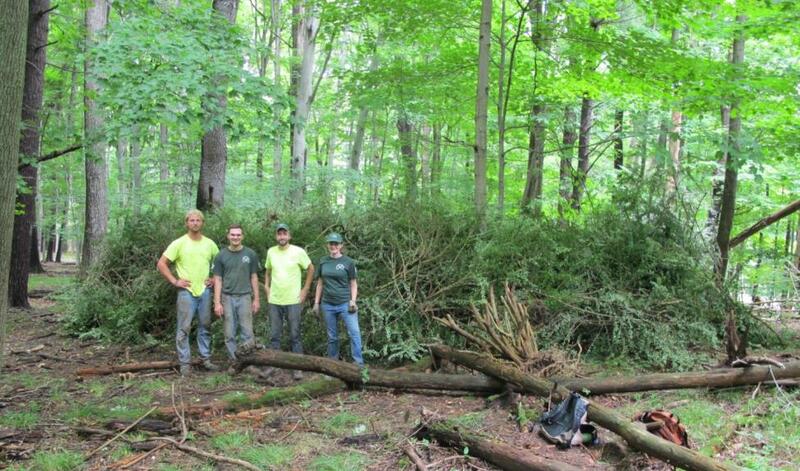 Several HWA early detections were made in Western NY’s Allegany State Park by dedicated volunteers, trained by Park staff to survey for the insect. Allegany just has a few isolated patches of HWA, and State Parks is working to keep those patches small. So far, the Adirondacks have escaped infestation, but they are not immune. This map shows the spread of HWA by township since 1987. Map from http://www.dec.ny.gov/animals/7250.html. How do we know all this information? The first step in determining if HWA is present is simply to look for it. Surveying for HWA takes diligence; the insects’ most visible life stage is the egg sac, which is present in the fall and winter. A hand lens is necessary to identify the tiny adults in the summer. Primarily through grant funding and volunteers, Parks has surveyed for HWA in 20 State Parks, and that number increases every year. Survey technique demonstration for volunteers in Allegany State Park. After surveying, maps are created and examined and hemlock stands are prioritized for treatment. Prioritization is a rigorous process which includes collaboration with state and local experts. 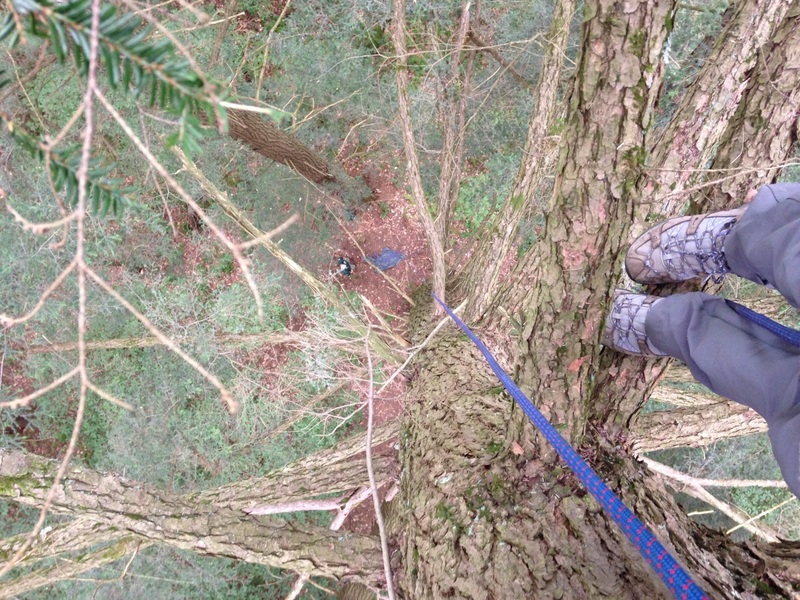 These experts ask questions like: Do dead/dying hemlocks pose a health and safety risk here? Is there an area of ecological significance, for example, an old growth stand or is there an insect or animal present which is dependent on hemlocks? Will the loss of hemlocks create a significant, negative change to aesthetics? Is this an area of early detection, where treatments could make a big difference? 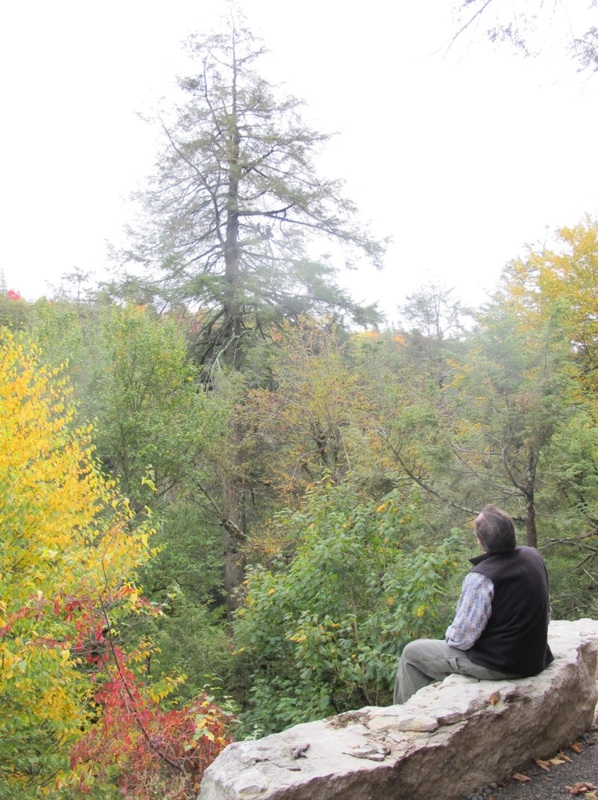 Mark Whitmore, of Cornell University, gazing at a hemlock in serious decline at Minnewaska State Park Preserve. Treatment for HWA does exist. Parks has chosen our methods through regular consultation with experts, based not only on what works, but what has the least impact on the environment. Pesticides are carefully sprayed onto the bark of hemlock trees, in the spring or early fall. The pesticides are taken up rapidly through the bark and into the tree, where hemlock’s circulation system takes it throughout the tree, to all the little branches. 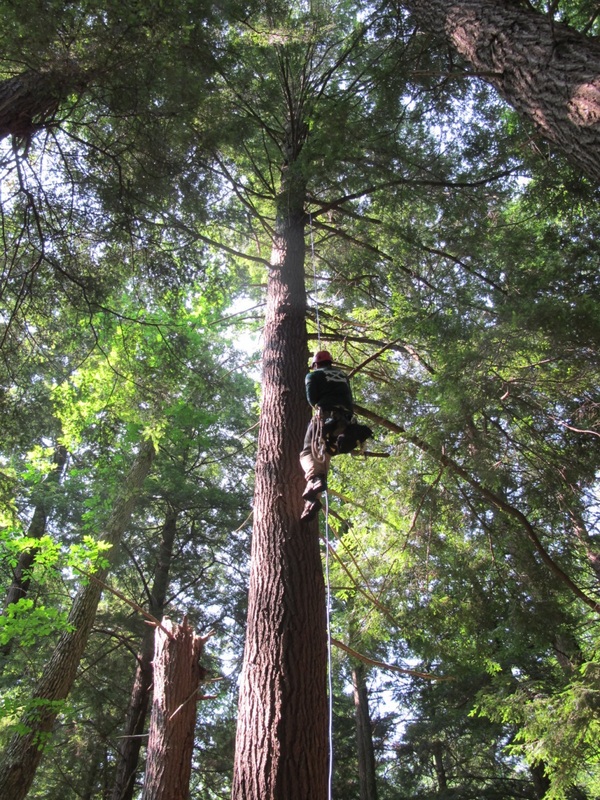 The HWA will not survive on treated hemlocks for the next 7 years. While this is certainly not a permanent solution, it does buy us much needed time. In conjunction with these treatments, Parks is also releasing biological control beetles. Biological control insects have an extensive approval process which can take a decade or more through the USDA. Many states have biological control review processes as well, including NY. These processes are designed to assess and evaluate the insect and its host specificity, the reproductive and cross breeding potential, and other factors. If, and only if, the insect is passes the host specificity and other tests, is it approved for release. Many biological control insects have been explored for control of HWA, one showing some promise is Laricobius nigrinus. These biological control beetles feed exclusively on HWA, and while they will not eliminate their food source, they can keep HWA populations in check so they are no longer killing hemlocks. While this is the ideal end result, it can take a decade or more before this is attained. Releasing a few hundred L. nirginus against millions of HWA means we need to buy time, through the use of pesticides, as these beetles work to increase their populations to levels where they can match HWA and keep it in balance. Invasive insects are notoriously difficult to contain. While we may never stop the onward march of HWA, we can reduce the negative impacts of hemlock loss in specific areas through human intervention. Sign up for an upcoming iMap Invasives training to learn how to report HWA when you spot it in State Parks’ forests. Post and photos by Alyssa Reid.